1682 The Lord Proprietors granted Major Maurice Mathews, Surveyor General, and Captain James Moore, future governor, land grants for Lot No. 1 and Lot No. 102, an area which covers all of the properties associated with the Stoll’s Alley of today. Lot 1 fronted on East Bay, and Lot 102 fronted on Church St. The southern border of both lots was Vanderhorst Creek, which was filled in the early nineteenth century and became Water Street. The area between the two lots was marshland extending north from the creek. 1693 Elisha Bennett, a Boston mariner, bought Lot 102 from Mathews and Moore. In March 1699, Bennett purchased the southern half of Lot 1 from Mathews and Moore, and in December he sold Lot 102 and his half of Lot 1 back to Moore. 1700 James Moore and his wife sold their property to Landgrave Thomas Smith II and his wife Mary Hyrne Smith. That same year, Smith received a grant for the marshland between Lots 1 and 102, on which the majority of the homes along the present Stoll’s Alley now stand. With this purchase, Smith owned the entire stretch along the present Stoll’s Alley. Eventually, the marshland between the original Lots 1 and 102 was filled in, and the alley extended to its present length between East Bay and Church St. There is little documentation about structures on Lots 1 and 102 while the Smiths owned the land. Between 1700 and 1748, however, a small passageway off East Bay was established to connect with Church Street through the interior of the property. Many informal documents state that small structures were constructed along the passageway, where harbor pilots lived. The area was called Pilot’s Alley, which later became Stoll’s Alley. 1736 William Screven (1712-1756), a James Island plantation owner, purchased the part of Lot 102 fronting on Church St. from Landgrave Thomas Smith. [Charleston County Register of Mesne Conveyance, Deed Book V3, page 210]. Subsequently, houses were built on either side of the Alley at 52 and 54 Church St. Houses were also built on his property at the present numbers 6, 8, and 10 Stoll’s Alley. 1740 After the death of Landgrave Thomas Smith II in 1738, his widow Mary Smith sold another portion of Lot 102 to James Fowler, properties that are now numbers 9 and 11 Stoll’s Alley. 1747 Seven years later, Mary Smith sold land that was along the south side of the Alley behind the property facing East Bay to Justinius Stoll and his wife Mary Taylor Stoll. Stoll (1704-1778), was a blacksmith whose shop was on East Bay next to Granville’s Bastion of the old walled city, a short walk away. His portion of land included that of the present numbers 3, 5, and 7 Stoll’s Alley. A 1-1/2 story brick house may have already existed on the property or he built it, the original building with dormers of the present 5 Stoll’s Alley. 1748 A year later, Stoll and his wife Mary conveyed the property that is now 7 Stoll’s Alley to William Screven, husband of their daughter Sarah. Screven, a planter from James Island, already owned the property at the west end and along the north side of the Alley. The present numbers 2 and 4 Stoll’s Alley remained connected to the property that fronted on East Bay on the north side of the Alley. 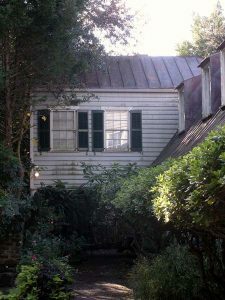 The Screven family had extensive connections to Stoll’s Alley. Rev. William Screven (1629-1713) and his wife Bridget Cutts (1654-1717), who had immigrated to Charleston from Kittery, Maine, in 1695, had eight children. One son was Savill Screven (1689-1719), who in 1718 married Martha Bremar (1700-1732). After Savill Screven’s death in 1719, Martha Bremar Screven married Theodore Trezevant Sr. (1690-1732). Their grandson Peter Trezevant (1768-1854) married Elizabeth Willoughby Farquhar (1772-1845) in 1789, and they moved into 5 Stoll’s Alley [see below]. Another son of William and Bridget Screven was Samuel Screven (1677-1731), who married [Sarah] Witter. He was a planter on James Island. One of their sons was William Screven (1712-1756), who in 1748 married Sarah Stoll, a daughter of Justinius and Mary Stoll. It was to him that the Stoll’s conveyed 7 Stoll’s Alley. William in turn conveyed the property to his brother James Screven (1706-1758), who was married to Mary Hyrne Smith, the daughter of William and Mary Smith. 1762 5 Stoll’s Alley was sold by the Stoll-Screven family to John Edwards. 1778 5 Stoll’s Alley was owned by William Russell, vendue master. 1779 Phoebe Stoll, Justinus’ second wife, and Thomas Rivers, his executor, sold the property at 3 Stoll’s Alley. 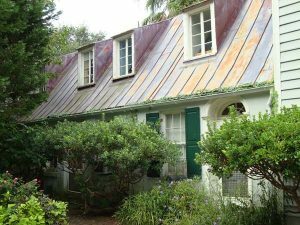 There was no house on the property until the mid-nineteenth century. 1783 William Russell was banished (as a Tory) and his properties were confiscated. He was indebted to Robert Farquhar, a maritime merchant who operated out of Charleston. Russell’s property on Stoll’s Alley was turned over to the Commanders of the Treasury. 1784 At age forty, Robert Farquhar was killed in a boating accident at Savannah. The executor of his will was Alexander Chisholm. After the earlier death of his wife in 1773, Farquhar’s only child, Elizabeth Willoughby Farquhar (1772-1845), was put in the care of relatives in Charleston. Between 1782 and 1788 she was boarded in London, England. 1789 At age sixteen, nine months after her return to America, Elizabeth Willoughby Farquhar, married Peter Trezevant, age twenty-one, in Charleston. The two young people may have met in London is 1786 when Peter visited there. After their marriage, they probably took up residence at 5 Stoll’s Alley, which as part of her father’s estate she and her husband inherited upon her marriage. Hence, there are no public records of the transfer of ownership at that time. 1790-1810 Peter and Elizabeth Trezevant had thirteen children between 1790 and 1815: Robert John (1790-1791, John Farquhar Trezevant (1791-1821), Elizabeth Catherine (1793-1795), Daniel Heyward (1796-1873), Martha (1797- ), Ann Timothy (1799-1864), Peter Dunlap (1802-1845), Lewis George (1804-1824), Theodore Mathias (1806-1868), Henry (1808-1809), Octavius Undecimus (1810-1866), Matilda Emmaline (1812- ), and Catherine Elizabeth (1815-1847). 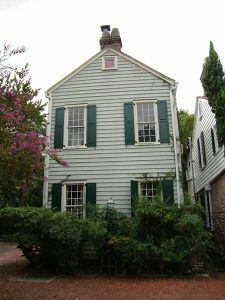 1809 During Peter and Elizabeth’s tenure at 5 Stoll’s Alley they constructed a two-story colonial-style frame structure adjoining the original brick house of c. 1748. 1826 At age seventy-five, John Farquhar (1751-1829), Robert’s brother, died in England. Elizabeth Farquhar Trezevant, as a niece, inherited a portion of his very large estate. As a result of that inheritance Peter and Elizabeth Trezevant (ages 58 and 54, respectively) moved to 31 Chester Terrace, Regent’s Park, London, England, where they maintained residence for the remainder of their lives. Five of their thirteen children were already dead, one was living in India, and two were married and settled in South Carolina. Son Daniel Heyward Trezevant and daughter Ann Trezevant Taylor were in Columbia. The widow of John Farquhar Trezevant was in Darien, Georgia. The other five children accompanied their parents to London. One son returned to the States, and the other four remained in England. 1927 Margaret Drury sold 5 Stoll’s Alley to Mary Townsend Marshall of 52 Church St. Mary had grown up at 39 Church St. as a daughter of Charles and Mary Townsend. The Townsends bought 52 Church St. about 1900. 1967 Alida Canfield died. She lived at 5 Stoll’s Alley during the years that she bought all of the other houses on the Alley and restored them. She willed 5 Stoll’s Alley to her daughter Frances Canfield Bonsal, and the property remains in the family today. Alida Canfield was born Alida Chandler Marshall in 1887. She was the youngest of the four daughters of Richard Maynard Marshall (1830-1904) and Frances Hoke Olmsted Marshall (1845-1929). The Marshall family home was at 39 Church St. Her husband was George Dana Canfield (1887-1963). They had four children: Frances (1909-2001), George (1911-? ), Alida (1912-1987), and Caroline (1917-1980). Frances Canfield married Warwich Potter Bonsal (1905-1956) and they had two children. Alida Canfield married Huger Sinkler (1908-1987) and they had one chile. Caroline Canfield married Joseph Seabrook Hanahan (1911-1992) and they had two children. The first Alida Canfield rescued all of the homes in Stoll’s Alley from the slum-like conditions that had existed since after the Civil War into the twentieth century. Beginning in 1919 and ending in 1938, she bought and restored numbers 2, 3, 4, 5, 7, 8, 9, and 10. (No. 6 was a tenement building that was raised. No. 11 was a dependency of 52 Church St.). Every home was willed to her three daughters and their families, and some of the homes are still in the extended family. Those of us lucky enough to have personal connections to any of those homes must be eternally grateful to Alida Canfield for saving them. And all of historic Charleston can be grateful for setting such a high standard for historic preservation. Lavelle, Brittany, “BVL Research 9/8/11 re addresses”: pdf. Lavelle, Brittany, “BVL Chain-of-Title Research 2012-2015”: pdf. Wiedman, Jamie. “5 Stoll’s Alley: A Brief History and Description.” Unpublished graduate paper, Clemson University/ College of Charleston, Graduate Program in Historic Preservation, 2010. I enjoyed your article very much as I have much interest in Stoll’s Alley and it’s history. My earliest known Stoll ancestor was Justinus Stoll, born c. 1704 and died 1778. My brother and several of my cousins and I have done extensive research on Justinus Stoll. While I know he was not the focus of your work I would love to hear any of your comments on what you found. We have a document written by John T. Wightman in 1933 giving extensive Stoll history and in 2009 we studied this document in depth and updated our Stoll family history. I know that Mr. Stockton gave Phoebe as a second wife of Justinus. We have not been able to prove that and have her as the wife of a second Justinus born c. 1720. Their daughter Ann Baker Stoll is recorded in St. Phillips Register as being born 5 Jan. 1766. If by chance you stumbled across any additional information in your research I would love to hear about it. Many thanks for your delightful article. We hope you can all enjoy your own stroll and make some wonderful memories from Stoll s Alley.